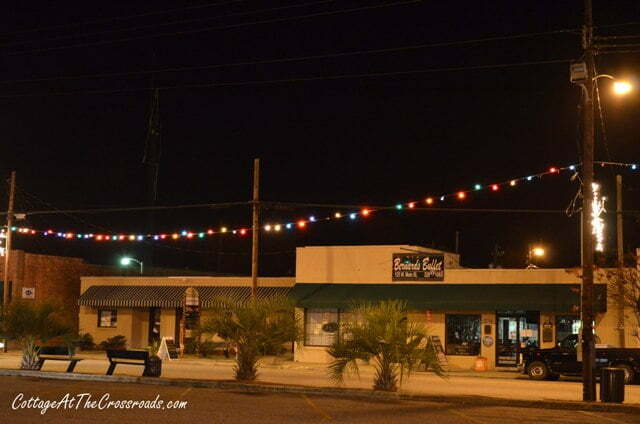 For as long as I can remember, the town of Lamar has put up these Christmas lights every year. And that’s well over 50 years! 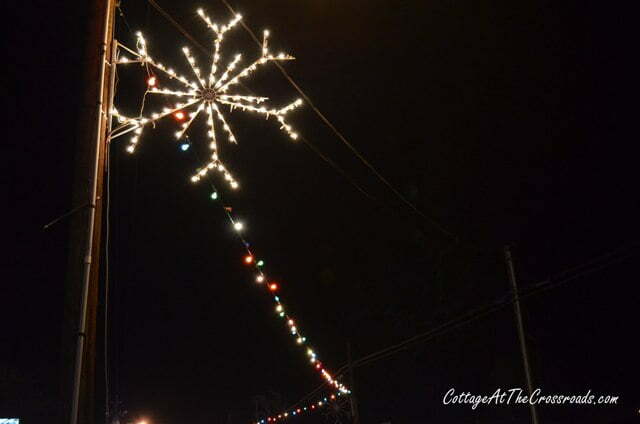 Not the snowflakes, but the strings of multi-colored bulbs that criss-cross Main Street. Since the wiring is so old and brittle and the bulbs are getting hard to find, there’s been talk of replacing them with something new and fancy. I say…NO WAY! In today’s vernacular, you could label these as vintage. That’s it, these are vintage lights which makes them hip and very vogue. Don’t you agree? Doesn’t this shot look like a movie set to you? If we would just park a ’57 Chevy, a 1955 GMC pickup truck, and a few other classic cars and trucks along Main Street, Hollywood could certainly recreate 1950s Small Town, USA. But this is not out of the 1950s. This is my hometown of Lamar today. And these Christmas lights bring back a lot of memories that I don’t want to lose. So be careful guys when you take these down again. Roll them up gently, store them away. These lights are special. I love the vintage look in your town and the snowflakes add just a little extra touch. Sometimes less is more. I love small towns. I grew up in one (Lexington, SC – not small anymore) and I live in one (Macclenny FL). 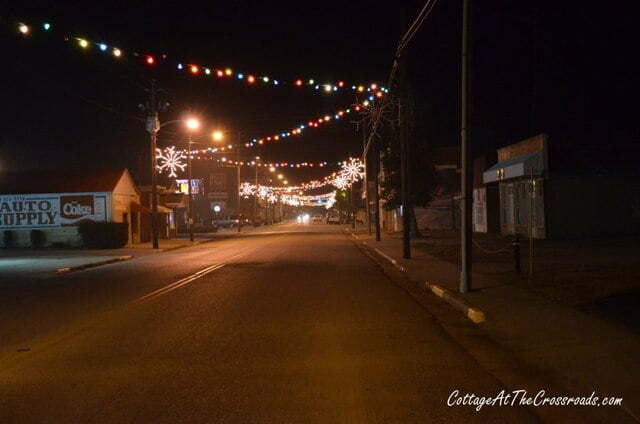 Our town does lights and we have a lighted Christmas parade the first Saturday in December every year. Hey … I remember you from the radio (Columbia). Was Woody on there too? His name is so familiar. Your picture does remind me of some scene from a vintage Christmas movie. The only thing missing is the snow! Lovely and vintage, looks light a postcard image, and brings back memories of my grandmother’s Christmas tree. Leo you should start a campaign: Save The Lights! Merry Christmas, Leo & Jane! And awwwwww, these lights take me back to my old hometown too. I so remember lights like this and it is so nostalgic and sweet. I hope they keep the going too, nothing like the older bulbs and lightstrands. Hope you both have a wonderful Christmas this year! Those lights are so sweet! 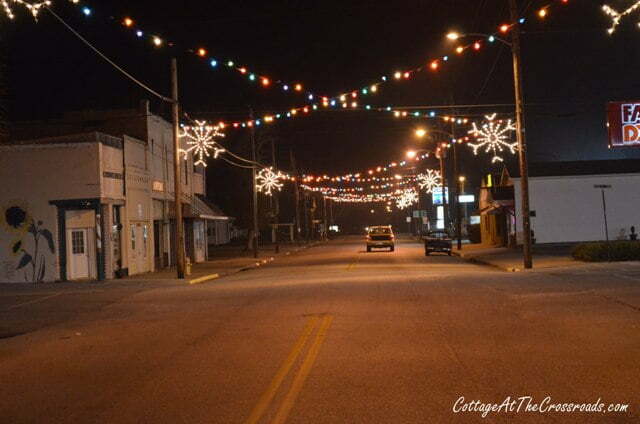 We have similar lights in our town….but they are only white….with outlines of stockings and snowflakes! They are great! And so are the memories! 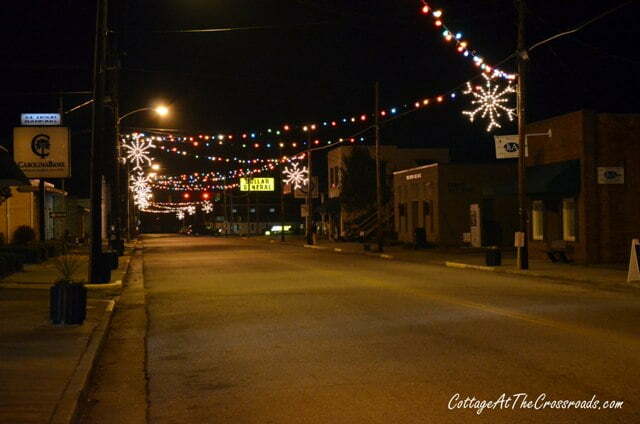 Your town looks so pretty & festive! Yes, it looks like a postcard from Smalltown, USA. Leo, Enjoyed looking at the Christmas lights in Lamar Yes this is very special! Thanks for sharing Leo. These are indeed special. Someone blogged that their LED outside lights had a gray pallor to them. Not everything new is the best. Agree – the vintage lights really set the scene in that town! Those are so cool Jane! We love vintage lighting too. I must disagree with my younger brother Leon. If you are serious about Lamar being hip and vogue, they should invest in some new LED lights. They are a big improvement over the older lights. You should use your blog to make something good happen. Ask everybody to send you 20 dollars to buy all new modern lights. They are so much easier to maintain and a lot brighter, and they use a lot less power. You could do something nice for your hometown that would last until you are long gone. And your bloggers would be proud to be associated with the project. it would be a green thing and they just may become know as The Leo Lights. If not the town of Lamar, then do it for Windham’s Crossroads. I’m just saying…. My first year teaching in Lamar was in1975,and I will always remember the people that make it a part of my heart forever. Those lights will remind me of many friends and students. I hope they can be repaired or replaced as a part of Lamar for the future.